Despite any inner...turmoil (aka overthinking) in my last post, I have to say that almost every morning I wake up with a very full heart. 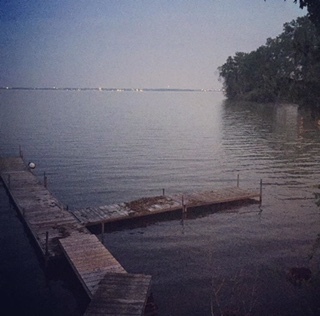 I haven't officially moved (but will be shortly), but basically, I'm living the lake life. It's in a house, filled with noise (the dogs), love (A and me and the dogs), and just....a kind of peace that I hadn't yet found. I've never been a city girl, yet somehow I made Montreal my home and it ended up feeling quite small...but I love walking up to the birds chirping, the dogs singing their good morning love song (aka either crying or howling for some love/attention/food), eating breakfast either looking out at the backyard, or as of this weekend, sitting in an outdoor recliner watching the dogs chase squirrels, bark, or chase each other. And once they run around in the morning, it's nap time until the afternoon. “Giving is virtuous, but so is accepting gifts gratefully.” ~Doe Zantamata I found that quote from this article and I felt like it could have easily be written by me. It's not to say that I don't find myself around giving and generous people, but...in most cases, I would rather give than receive in my areas and aspects of my life. What isn't so easy, is to accept the kindness of others.